Here's another "guess the subject of this photo" post. As always (or at least the one other time I did one of these), the item in question is a type of food. And I do believe that this one is more difficult than the last one. It's a veiny grape, really close up. It looks like a pitcher plant. Are pitcher plants edible? I'm also not sure if pitcher plants are edible. I think of them as eaters rather than eatees, but that doesn't mean they're not! Here's a clue...the part you can see in the photo isn't the part we typically eat. It's one of the pods from the 1979 remake of "Invasion of the Body Snatchers". It's a nubbin. Some kind of nubbin. Cathy -- What's a nubbin??? The dictionary definition is "a stunted ear of corn." Is that what you meant? We have a winner -- way to go ARM!! 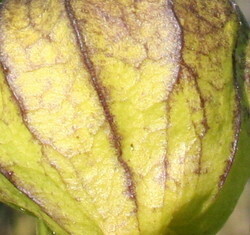 It is indeed a tomatillo husk. It's in the Solanaceae or Nightshade plant family, along with tomatoes, peppers, eggplant, potatoes etc. Other, closer relatives are the Cape Gooseberry and the ornamental Chinese Lantern. I'll try to find another fun photo soon! I don't believe you. I think you made it out of papier mâché just to torment me.